When a competitor set up shop too close to Michael Geiger's Moe's Southwest Grill, he and his partner John Iaquinta fired back with a volley of cheese dip. "We started planning ways to disrupt grand openings for competitors that select real estate close to our existing locations," Geiger recalls. One of the more successful tactics involved giving away our world famous Queso on the day of a competitor's big day. It is a great differentiator of ours and we wanted to highlight it. After we did it a few times and saw net revenue more than double on those days (as well as seeing empty parking lots for our competitor's openings), the brand took note and made it a national one-day event." Six years later, the brand's nationwide Free Queso Day nationwide each September is one of the top business days of the year for the system. That's just one of the reasons Geiger and his Big Plan Group received the 2016 Innovation MVP Award. For Big Plan, which operates seven Moe's locations in the Pittsburgh area, taking a fresh approach is just the way Geiger and partner John Iaquinta do business. The pair converted punch cards into a mobile loyalty program long before it was common. More recently, they leveraged community service contributions with its "Buy One, Give One" catering program that benefits the company's relationship with Beverly's Birthdays, a local nonprofit that provides birthday celebrations to homeless children and families in need. 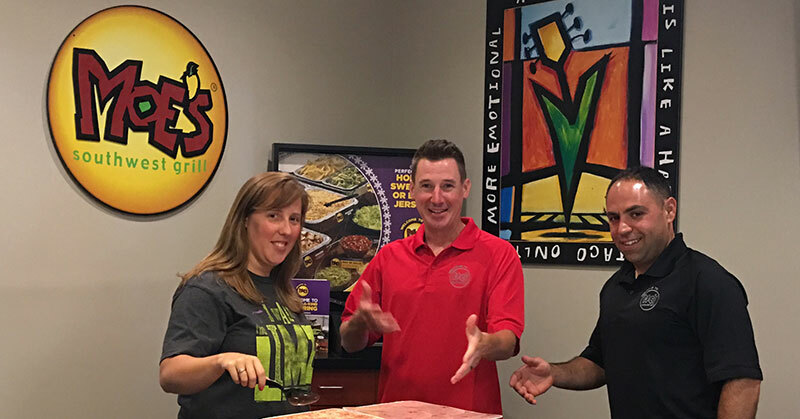 Geiger, who honed his innovative mindset at a small mobile technology firm, initially sought a path to diversify his income through franchising and found Moe's. In 2013, after 7 years of double duty and 100 nights a year on the road, he left his tech job and set his sights solely on Moe's. His background in the tech world, where success often means new product launches and beating competitors to market, continues to serve him well as a franchisee. "We are very opposed to allowing complacency in operations," he says. "We preach the same messages every day: high-quality food, facility cleanliness, and over-the-top guest interaction and experience. If we do not keep the framing of the message fresh, beating the same drum day after day can turn into background noise for our crew. So to link it back to technology, it is taking the stability of a legacy product and injecting the hype of a new one to keep operations performing at their peak." Geiger credits Moe's for its ability to balance the needs of the brand with the perspective of its franchisees to seize growth opportunities. "I think a brand is foolish if they do not take advantage of the great minds they have in their system as franchisees," he says. "Clearly, entrepreneurs who are self-made have some value to bring to the conversation when creating the road map for a brand's future. By engaging that asset of their business--which costs nothing, by the way--they maximize their resources." I fell in love with basketball at a young age and through a lot of practice became a pretty good player. My parents refused to allow it to define me and forced me to develop my vocabulary and speaking skills through study and activities like debate team. While I was not thrilled with it at 16, when I had to miss practice to attend debate events, they saw something in me that needed to be cultivated. I will forever be appreciative, because I now know that the ability to have confidence in yourself and your words in any environment is a priceless and rare skill in the sales and business world. The development of that skill set landed me an interview and eventual job offer in sales, at just 24, with a small tech company in Tampa called Syniverse Technologies. David Wasserman was the guy who hired me into a position that I was certainly not yet seasoned for, but he took a shot with me. He opened every pathway for me to learn from him, customers, and even the CEO of the company. I took advantage of every opportunity that presented itself to be quiet, look around the room for the person who could teach me something, and take it in. I credit those moments and experiences in forming the core of my philosophies in business today. I sent a note to the former CEO of Syniverse of few years back, thanking him for granting access and not creating the "walled garden" of secrets that many executives do to protect their position and perceived value. His response was priceless and showed me that I'm still learning to this day: "I was the same CEO for thousands of people. You chose to take advantage of the access and knowledge when others did not." I think that can summarize how my management style and approach to business developed. Named to the Presidents Club, the award for top sales at Syniverse, four consecutive years and five out of seven years total. My partner John Iaquinta and I have also been named marketing or local store marketing Franchisee of the Year several times from Moe's, and in 2014 we were an Ernst & Young Entrepreneur of the Year Awards finalist. Named to the Pittsburgh 100 the past 3 years as one of the fastest-growing privately held companies in the region by the Pittsburgh Business Times. Becoming a father! Varies by design. My partner Johnny and I call it the "shiny object conversation." We try to keep our schedules as fluid as possible to ensure we are always able to accommodate the needs of the business and our team. I view my role as a support mechanism, as much as that of a leader in the organization. "That's not my job" is a forbidden phrase. Anything that provides insight on my surroundings. What is the newest real estate project in Pittsburgh? What is the latest menu item or marketing program my competitor is rolling out? Does the fast casual segment have a new emerging trend that I can adapt to my own operation? From one of my older brothers, Mark. You have many people in your life, but only go home to one of them every night (your wife). That person always needs to be the priority in decision-making. Ironically, it has also translated directly to my business life as well. Johnny and I are the only partners and investors in our company, so applying the same philosophy to business decisions has made for a fruitful and harmonious partnership. Making a meaningful impact on people's lives, be it helping a high school employee with a school project, advising a young manager ascending our ranks on the virtues of home ownership and retirement savings, or a philanthropic endeavor in the community. I want to know that my business activity helped to make the world a better place each day. If your focus is always directed squarely at quality, honesty, and supporting the top-level talent you surround yourself with, everything else will fall into place. Collaborative and empowering. I've always described myself as the anti-micromanager. Finding the right people who fit and buy into our organization. I value loyalty over just about anything else and that is often very hard to find or develop. Driven, charismatic, big thinker, but not afraid to dive in and get my hands dirty. We've always looked at internal development as the first option. The average tenure of our upper management team is about eight years. The pace at which we have grown over the past three to four years has made exclusively promoting and moving internal candidates increasingly difficult, so we have been going outside the organization more recently. NA, but our AUV is significantly higher than the average Moe's AUV. Hit a fifth consecutive year of double-digit comp sales growth. Continue growing our catering sales support team to three full-time positions. The team has achieved a fourth straight year of more than 25 percent growth. Play a key role in helping our local charity partner, Beverly's Birthdays, elevate their brand awareness and crush their financial goals. We rely heavily on same store sales as an indicator of the health of our business. I think judging your success by store count can get you into trouble because chasing a store count goal can cloud your judgment on the quality of a location. Seven locations in nine years has been our growth trajectory. You could call that a tortoise approach by many standards, but I will take my double-digit SSS comps every year--10 times out of 10--over having double the stores and running flat sales growth. Taking the time to develop strong bonds in the communities we serve and strong management teams has worked out well. In 5 years, I want to have completed our Moe's footprint build-out in the Pittsburgh region and have a minimum of 60,000 square feet of retail property in our portfolio. We will certainly do at least two more stores. From there, great real estate that is strategically positioned will dictate the opportunities we pursue. I also have specific goals I want to achieve in terms of key employees/roles reaching income levels through our bonus program. In 10 years, I want my top priority to be sitting in the bleachers to watch my son play high school baseball, basketball, or whatever ends up being his passion. If I can honestly say that is my mindset and what I'm doing, everything else I need to achieve will have been accomplished. Our average hourly wage is right about $10 an hour, about 40 percent higher than the state minimum wage. This, coupled with aggressive management bonus structures, has always been a focus for us. We expect premium performance and are willing to pay a premium wage for it. We've always offered a full benefit package related to healthcare long before we were required to, and a generous 401(k) match. We do a senior employee event each year for everyone who has been with us more than two years, as well as a themed and fun manager holiday party. Also, as an incentive to be healthy, we do a mud run event each year. This year, for the first time, it will be a BattleFrog obstacle race. Last, we make it a priority to integrate philanthropic programs with employee incentives to ensure they understand how important it is for us to give back to the communities we serve. An exit strategy continues to be a moving target. As we have grown the business, our exit strategy has become more of a diversity strategy. We are now acquiring and developing our own real estate for new locations to ensure long-term security. Johnny and I have always taken the approach that the franchisor is the landlord and we are the tenant. As such, you can just pay your rent and live in the surroundings as is, or you can spruce the place up. We have always opted for the latter. I think that is why we are being recognized--because we are not sitting back. We are fully engaged in our business and constantly looking for new ways to raise brand awareness and drive traffic to our restaurants. We have contributed things as simple as designing a new bag to use for transporting chips on catering jobs, to the significant impact of coming up with the core idea that evolved into Moe's annual nationwide Free Queso Day promotion. We started planning ways to disrupt grand openings for competitors that select real estate close to our existing locations. One of the more successful tactics involved giving away our world famous Queso on the day of a competitor's big day. It is a great differentiator of ours and we wanted to highlight it. After we did it a few times and saw net revenue more than double on those days (as well as seeing empty parking lots for our competitor's openings), the brand took note and made it a national one-day event. Six years later, when we host Free Queso Day nationwide every September, it is one of the top system-wide business days of the year. I am on the brand's franchise advisory council and see that platform as a responsibility to ensure that as Moe's grows nationally we don't lose our roots in local communities. We recently have launched national media programs, and I am very proud we have grown to that level. We cannot forget that we got to this point because of local efforts, however, and I see that as a role we as franchisees need to play. See Free Queso Day above. I have also recently developed a program used on "Cinco de Moe's" that offers corporate customers an incentive to cater on Cinco de Mayo by providing small Moe Money gift certificates the corporate customer can give to their employees, in addition to the food. This program has now been launched system-wide with a massive impact, driving record-breaking catering volume in our market every year. An inferiority complex when it comes to achievement. Regardless of what we may achieve or accomplish, Johnny and I never feel like we have done enough. I constantly find myself, saying, "But what if..."
This answer can be summarized with one sentence. We believe it is our obligation to give back to the communities we serve. We have met with the success we have only because people patronize our restaurants, and we owe every bit of recognition to those communities and patrons. What leadership qualities are important to you and to your team? A leader needs to be selfless. A leader needs to be willing to do anything they ask someone else to do. When that is not the case, trust and respect break down and failure will soon follow. Last, as referenced earlier, loyalty needs to be valued above anything else--and that loyalty requires reciprocity.